The last two issues of Boeing’s Current Market Outlook, included a slide in which Boeing wanted to prove that their forecasts have been more accurate in the last 10 years. They compare actual aircraft demand versus both Airbus and Boeing forecasts in the year 2000. Boeing Current Market Outlook, different views. I find it interesting that all segments are described as such, segments: “Single-aisle”, “Twin-aisle”, “Large”… except for Airbus forecast in which Boeing introduces the model “A380”. As if wanting to point that Airbus was wrong in its A380 forecast… as if wanting to steer demand. Actual demand (2000-09): ~300 aircraft. Boeing forecast (2000-19): ~700 aircraft, assuming equal split (among the 2 decades): ~350 a/c in 2000-09. Airbus forecast (2000-19): ~1,300 aircraft, assuming equal split: ~650 a/c in 2000-09 (although A380 first flight took place only in April 2005). As of today, Airbus has sold 234 A380s, including the latest 32 from Emirates. The prospects for the aircraft seem brighter as operators started operating it, on the other hand Boeing 747-8 orders have stalled since 2007. “In an industry defined by continual change, customers expect Boeing to help them prepare for the challenges ahead. That’s why we work closely with customers to understand their long-term requirements. An airplane smaller than the 737-600, seating 80 to 100 passengers. An airplane larger than today’s 747-400. A capable and cost-effective supersonic jetliner. 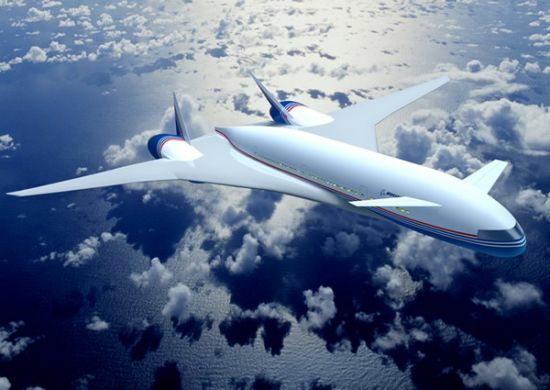 Artist image of Boeing Sonic Cruiser. “Most major aerospace companies agree that airlines will require 500 to 700 airplanes capable of carrying more than 500 passengers. Boeing forecasts 500 airplanes will be needed by the year 2015. Much of the demand for these very large airplanes will be generated by steady growth in air travel to and from Asia, and by capacity constraints at some of the world’s largest airports. The 747-600X, with its ability to carry 548 passengers on routes up to 7,750 nautical miles (8,900 statute miles or 14,350 km), is designed to fill this market need. It will allow airlines to accommodate traffic growth without increasing the number of departures scheduled for busy airports. During the next 20 years, airlines also will need approximately 600 airplanes capable of carrying between 400 and 500 passengers. Later on, Boeing changed its forecast down to 700 aircraft.